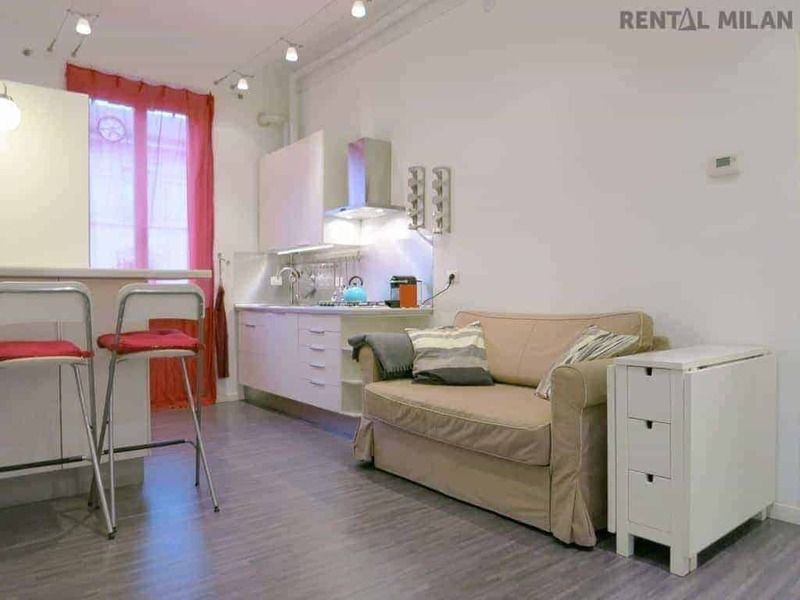 Just totally refurbished 1 bedroom apartment with a nice and modern design, quiet and bright. A large hallway takes you to the living room with a couch and TV. Modern fully equipped kitchen with dishwasher and with both “breakfast bar” table with stools and table with chairs. The comfortable bedroom has a double bed, a wardrobe and useful storage closets. Modern and well refined bathroom with a large shower. Gray wooden floor. The apartment is equipped with all the amenities, brand-new appliances (oven, dishwasher, washing machine) and high speed internet. It’s on the 3rd floor without elevator. Very well served area! Just a few minutes walking: supermarket, laundry, pharmacy, several restaurants, bars and clubs. Very close to Piazzale Loreto and Corso Buenos Aires for shopping. – 10 minutes walking from Piazzale Loreto and Piazza Caiazzo (3 minutes away by Tram 1) from where you can take 90-91 and 92 buses connecting the entire city.